The coaxial (coax) transmission line geometry, described by Figure 1, consists of a center conductor; imbedded within a dielectric material; surrounded by a continuous outer conductor; also known as the shield. All share the same geometric center axis; hence the name coaxial. It is common practice to transmit the signal on the center conductor, while the outer conductor provides the return path for current back to the source. The shield is usually grounded at both ends. field patterns with respect to the current through the structure. As the signal propagates along the transmission line, an electromagnetic field is set up between the outer surface of the center conductor and the inner surface of the shield. As illustrated in red, the electric E-field pattern sets the capacitance per unit length, and the magnetic H-field, in blue, sets the inductance. For the center conductor, the “X” represents current flowing into the page and the “.” (dots) within the shield ring is current flowing out of the page. Figure 2 describes the magnetic-field relationship for a coax geometry. As current propagates along the center conductor, concentric magnetic-field lines (blue) are created in the direction as shown following the right hand rule. Whenever an AC current carrying conductor is in close proximity to a conducting plane, some of the magnetic-field lines penetrate it. 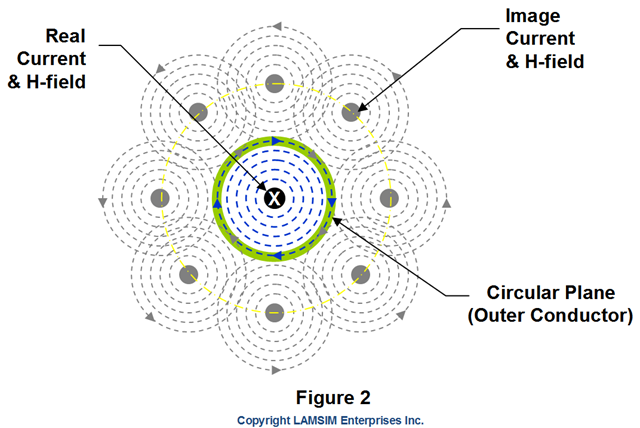 If this plane totally surrounds the inner conductor, it becomes the outer conductor in a coax geometry, and some of the magnetic-field lines penetrate the entire circumference. When the current changes direction, the associated magnetic-field lines also change direction, causing small voltages to be induced in the outer conductor. These voltages create eddy currents, which in turn, produce their own magnetic-fields. Eddy current-induced magnetic-field line patterns look exactly like magnetic-field lines (grey) from imaginary currents surrounding the outer conductor. These imaginary currents are referred to as image currents, and have the same magnitude as the real current; except they are in the opposite direction . For simplicity, there are only eight image currents shown. But in reality, there are many more; forming a continuous loop of imaginary currents on a radius equal to twice the radius of the outer conductor to the center of the circle. The image currents create associated image magnetic-field lines in the opposite direction of the real field lines. 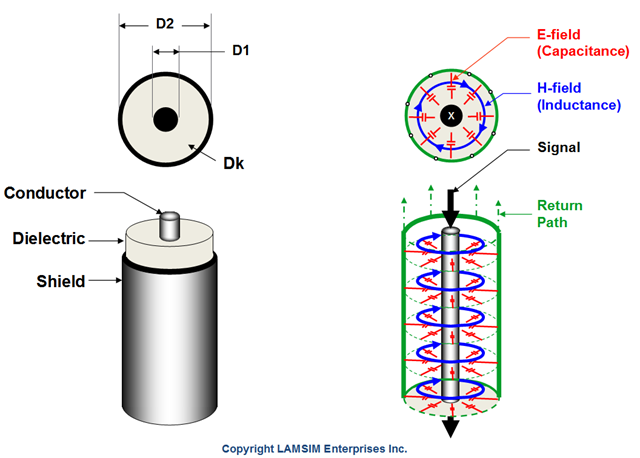 As a result, the real magnetic-field lines are compressed and are entirely contained within the outer conductor. The outer conductor thus forms a shield preventing external magnetic-fields from coupling noise onto the main signal and likewise, prevents its own magnetic field from escaping and coupling to other cables or equipment. This is why it is a popular choice for RF applications. 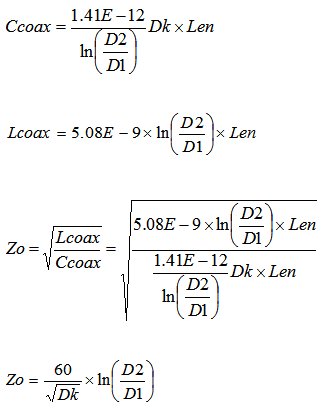 The nice thing about a coaxial transmission line is you can use equations to calculate the exact inductance and capacitance per unit length. There are only two other geometries that can do the same. They are, twin-rod and rod-over-plane; which I will cover at a later time in separate design notes. The coaxial structure can be flexible or semi-rigid in construction. Flexible coax is used for cable applications; like distributing cable TV or connecting radio transmitters/receivers with their antennas. To achieve its flexibility, the shield is usually braided and is protected by an outer plastic sheathing. Being flexible, the same cable can be reconfigured for different equipment applications. Semi-rigid coax, in comparison, employs a solid tubular outer shield, which yields 100% RF shielding, and enables the dielectric material and center conductor to maintain a constant spacing; even through bends. If you have ever worked on your automobile brakes, semi-rigid coax resembles the rigid brake lines routed through the chassis to the wheels. Semi-rigid coax is usually used for microwave applications where optimum impedance control is required. A bending tool is needed to form it to a consistent radius. After initial forming and installation, it is not intended to be flexed or reconfigured.